Paula DeSimone, artist, author, and educator is a graduate of Massachusetts College of Art in Boston. 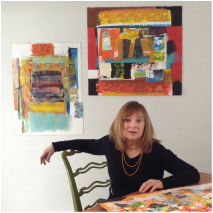 Ms. DeSimone has over 30 years of experience in arts education and has taught at such prestigious institutions as RISD - Continuing Education, the Museum of Fine Arts Boston, the Fuller Craft Museum, the Attleboro Arts Museum, and the DeCordova Museum. She is a current member of the Cambridge Art Association as well as the Monotype Guild of New England. Ms. DeSimone has authored numerous instructional texts available worldwide. Her work is held in distinguished hospital and corporate collections, including Children's Hospital - Boston, Newton Wellesley Hospital and U-Mass Memorial, as well as private collections internationally. She is represented by L’Attitude Gallery, Newbury St., Boson, MA,﻿﻿﻿﻿ L'Attitude Website. National Prize Show 2016, Cambridge Art Association "Transcending Color Fields"